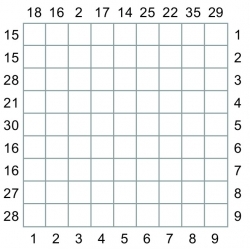 Kakurasu is played on a rectangular or square grid. The goal is to color in some of the cells to satisfy the clues. The numbers across the top and down the left are the clues, and equal the row and column totals for the black squares. The numbers across the bottom and down the right are the values for each of the squares in the rows and columns (the first square in a row or column is worth 1, the second 2, the third 3, etc. ).